Qivas Therapy for Treatment of Implant Associated MDR Bacterial Infection. QiVAS therapy is a new method which can be used to treat infections associated with orthopaedic implants without removal of implant. Department of Orthopaedics, Consultant Orthopaedic Surgeon , Bombay Hospital, Indore. India. 10 Patrakar colony, 103 Anuj Apartments, Indore. India. Introduction: Orthopedic implant-associated infections are difficult to treat, both physically and psychologically, for the patient and the surgeon as well. Organisms capable of forming biofilms tend to be more virulent and have ability of causing chronic infections. Chronic implant associated infections are very difficult to treat, requires a lot of time, money and other resources. Chronic infections produce a lot of morbidity and sometimes mortality to the patient. Case report: A 40-year-old male treated for bilateral acetabular fracture sustained after fall from height due to an episode of seizure. After acetabular surgery, he developed surgical site infection unresponsive to wound wash and intravenous antibiotics. After two weeks, we started treatment with Qurion solution and Vacuum assisted suction (QiVAS) to which patient responded very well and his infection was cured. We are not aware of any study or case report using QiVAS therapy for treatment of infection associated with orthopaedic implant. 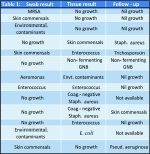 Conclusion: Orthopaedic implant related infection can be difficult to treat especially if caused by multidrug resistant organisms capable of forming biofilm. QiVAS therapy is a new method which can be used in such difficult situations to treat infection without removal of implant within short period of time thus reducing morbidity for patients. Keywords: Chronic implant associated infection, Surgical site infection, Qurion, Infection, Vacuum assisted suction, QiVAS. Chronic infections associated with orthopaedic implants are characterized by bacterial colonization and biofilm formation on the implanted device and infection of adjacent tissue. Bacteria in the biofilm are far more resistant to antibiotics and result in persistent infection despite aggressive antibiotic therapy [1, 2]. QiVAS therapy is a new method which can be used in such difficult situation to treat infection without removal of implant within short period of time thus reducing cost and morbidity for patients. A 40-year-old male presented in casualty with a history of seizures that let to fall from 10 feet height resulting in injury to both hips and left shoulder. He was diagnosed with cerebral venous thrombosis and started on heparin. On X-rays & CT scan (Fig. 1, 2), he was diagnosed to have bilateral acetabular fracture and three part left proximal humerus fracture. 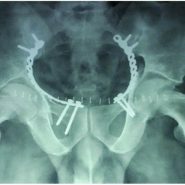 He was operated for bilateral acetabular fracture using modified Stoppa’s approach and fixed with buttress plate in true pelvis on both sides (Fig. 3). On post op day 3, he had fever & discharge from suture site, dressing was done and pus culture and sensitivity done. Wound wash was done to eradicate infection. Culture showed growth of Klebsiella and anaerobes sensitive to cefoperazone sulbactum, clindamycin and amikacin. The pus discharge resumed again after 3 days of wound wash and antibiotics. This time culture sensitivity tests showed resistance to cefoperazone sulbactum so chloremphenical was started which decreased the pus discharge but could not stop it. Based on the sensitivity tests, meropenem was started which stopped the discharge for 5 days then again the discharge started. At this time about 2 weeks after the first surgery, it was decided to start irrigation with Qurion solution for an hour and then continue Vacumn assisted suction (VAS). At both ends of the suture line single stitches were removed, at one end infant feeding tube was put for irrigation with qurion solution and at the other end infant feeding tube inserted for vacuum assisted suction (Fig. 4). Daily Qurion irrigation was done in morning and evening for one hour during which vacuum assisted suction was stopped. After one hour again vacuum assisted suction was started. After 2 days of starting Qurion irrigation & vacuum assisted suction therpy (QiVAS), the suture site became dry. We continued QiVAS therapy for 2 weeks with antibiotic meropenem. Blood counts and CRP were within normal range after 2 weeks of QiVAS therapy and patient was discharged. Patient was followed up at 3 months and 6 months with no evidence of infection (Fig. 5). Orthopedic implant-associated infections are difficult to treat, both physically and psychologically for the patient and the surgeon as well. Organisms capable of forming biofilms tend to be more virulent. Biofilm communities are far less susceptible to antimicrobial agents than planktonic organisms because most antimicrobial agents work by disrupting active metabolic processes, and biofilms contain large pockets of inactive, sessile bacteria which are unaffected by these agents. Finally, infecting organisms have developed methods for hijacking the body’s defense mechanisms and matrix proteins to adhere to surfaces and form biofilms [1, 2]. Gram-negative opportunistic pathogen, Klebsiella pneumoniae, is responsible for causing a spectrum of community-acquired and nosocomial infections and typically infects patients with indwelling medical devices, especially urinary catheters and orthopaedic implants on which this microorganism is able to grow as a biofilm . The increasingly frequent acquisition of antibiotic resistance by K. pneumoniae strains has given rise to a global spread of this multidrug-resistant pathogen, mostly at the hospital level. This scenario is exacerbated when it is noted that intrinsic resistance to antimicrobial agents dramatically increases when K. pneumoniae strains grow as a biofilm. Although K. pneumoniae possesses only moderate amounts of chromosomal penicillinases, it is a well-known “collector” of multidrug resistance plasmids that commonly encoded resistance to aminoglycosides, till the end of 1980s, while later, encoding extended-spectrum β-lactamases (ESBLs), mostly Temoniera (TEMs) and Sulfhydryl variable (SHVs) active against last generation cephalosporins, as well as a variety of genes conferring resistance to drugs other than β-lactams[3, 4]. The acquisition of these plasmids and the occurrence of chromosomal mutations that confer resistance to fluoroquinolones often makes the treatment of K. pneumoniae healthcare-associated infections possible only by using carbapenems as “last-line of defense” antibiotics  . Unfortunately, from the early 2000s, multidrug-resistant (MDR) K. pneumoniae strains started to produce also “carbapenemases” encoded by transmissible plasmids and rapidly disseminated within both acute hospitals and long-term care facilities. Later, other enterobacterial species, including E. coli, acquired carbapenemase genes, thus suggesting that K. pneumoniae may have acted as a pool of β-lactamases . In our case, infection was caused by Klebseilla pnemoniae and anaerobes, as antibiotics amikacin, cefoperazone- sulbactum and chlorempnenical were not able to control infection even after wound wash. Imipenam was started which also showed transient response, this pattern indicates that probably the organisms became multidrug resistant and well established in biofilm. This is a very scary situation as at this point implant removal may be required to cure the infection but in the given case, implant removal so early would have been very detrimental for the patient. So we thought of a new strategy and started combination of qurion and vaccumn assited suction (QiVAS) therapy. According to our knowledge, such therapy has never been used in the past. Qurion  has a unique 4 way anti-microbial mode of action:1. disrupts cell membrane, 2. condenses microbial DNA & interferes with cell replication, 3. disrupts respiration and4. induces apoptosis. Qurion  is an ideal solution for both the initial treatment of bio burden and as a continuous facilitator of the wound healing process. Synergistic effect of silver ions and menthol — allows for a very low concentration of silver ions and enables Qurion to be an extremely effective antimicrobial, non-toxic, safe and painless. Other key solution components are responsible for penetration, maceration prevention, elimination of odor, and overall pH neutralization. Qurion has a broad anti-microbial action on:- Methicillin Resistant Staphylococcus aureus (MRSA), Pseudomonas aeruginosa, Escherichia coli, Klebsellia pneumonia, Staphylococcus epidermidis, Candida albicans, Aspergillus niger. Vacuum assisted suction [6, 7, 8] (VAS) reduces bacterial load of gram negative bacteria thus reducing infected material volume. VAS also reduces volume available for pus and other infective material to collect thus reducing infective load. VAS may also disrupt bacterial biofilm by its negative pressure. 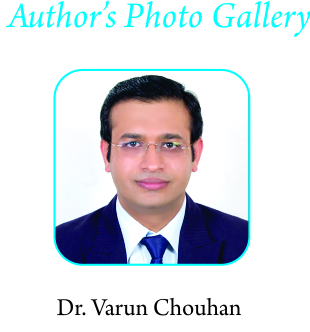 Thus, synergistic action of Qurion and VAS can help to cure chronic implant related infection. Orthopaedic implant related infection can be very difficult to treat especially if caused by multidrug resistant organisms capable of forming biofilm. QiVAS therapy is a new method which can be used in such difficult situation to treat infection without removal of implant within short period of time thus reducing cost and morbidity for patients. QiVAS therapy is new method which can be used to treat chronic implant associated infection without removal of implant within short period of time thus reducing cost and morbidity for patients. 1.Bjarnsholt T. The role of bacterial biofilms in chronic infections. APMIS Suppl. 2013;(136):1-51. doi: 10.1111/apm.12099. 2. Jacovide C, Parvizi J.. Biofilm infections: Newer understanding of old problem. Orthopedics Today September 2010. 3. Vuotto C, Longo F, PiaBalice M, Donelli G and Varaldo P E. Antibiotic resistance related to biofilm formation in Klebsiella pnemoniae. Pathogen 2014;3:743-758. 8. Streubel P N, Stinner D J, Obremskey W T,.Use of Negative-pressure Wound Therapy in Orthopaedic Trauma. JAAOS, Published: 9/1/2012.